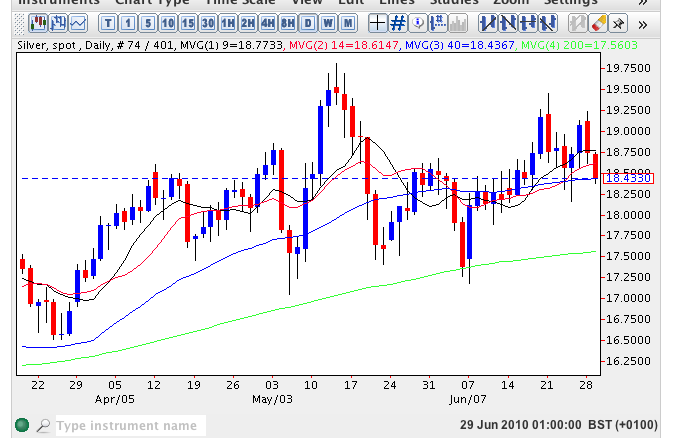 Spot silver prices followed gold yesterday by closing the silver trading session lower with a relatively wide spread down candle but one which found support from both the 9 and 14 day moving averages. As such this appears to be only a temporary pullback and we should expect to see spot silver continue its bullish sentiment in due course. Indeed there many commodity analysts who consider silver could even outperform gold and for evidence of this one need look no further than silver’s performance against sterling where the industrial metal is more than 20% up since March 2008. Part of the reason for the underperformance in spot silver is that it still remains the preserve of relatively few contrarian investors and coupled with this the media and financial press rarely, if ever, cover it. Furthermore, silver is also classified as an industrial metal so unlike gold has been strongly influenced by the recent economic cycles. However, the longer term outlook for spot silver is now extremely positive as the demand/supply relationship tips in its favour as the global economy begins to recover from the recent “Great Recession”. Finally this longer term bullish view is clearly evidenced on the monthly chart where silver prices have risen steadily since the low of 2008 will full support from the 9 and 14 month moving averages which are well above the 40 month.